The Automatic Wall mounted pressure washer systems are housed in strong steel lockable containers, and a permanent connection is made to mains power and water services, and a direct connection to a provided self bunded fuel tank. 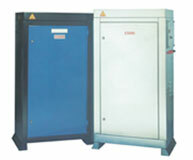 The controls for temperature, flow, pressure, detergent amount are all contained inside the cabinet. The cabinet is then placed within the provided building, and a remote switch fitted to allow the operator to switch on, and the unit automatically switches off. A preset amount of detergent is added simply by changing the wash lance and there is no need for the operator to attempt any alterations to the settings, or to need to fill the machine with detergent or fuel. Morclean offer both standard models and built to order models with a variety of different pressures. For more information please contact Morclean on 0800 1200 402 or info@morclean.com for further advise and assistance.